Gypsum, also called plaster, is an evaporite mineral most commonly found in layered sedimentary deposits in association with halite, anhydrite, sulfur, calcite and dolomite. Gypsum (CaSO4.2H2O) is very similar to Anhydrite (CaSO4). Gypsum is the most common sulfate mineral. Gypsum uses include: manufacture of wallboard, cement, plaster of Paris, soil conditioning, a hardening retarder in Portland cement. Varieties of gypsum known as “satin spar” and “alabaster” are used for a variety of ornamental purposes, however their low hardness limits their durability. YIFAN gypsum crusher has excellent performance in gypsum crushing and provides professional gypsum crushing solution. YIFAN gypsum crusher is featured with high quality, high capacity, high efficiency, long service time and less down time. YIFAN has developed gypsum crusher for several decades. YIFAN gypsum crusher does well in gypsum crushing and is welcomed by our customers. YIFAN gypsum crusher has four series: jaw crusher, impact crusher, cone crusher and vertical shaft impact crusher. Besides crushing equipment, we can also provide you with the optional equipment such as vibrating feeder, vibrating screen, belt conveyor, dryer and so on. Gypsum crushing process usually happens before the heating segment. Since gypsum ore is exploded from mines, gypsum ores are filled into primary crushing plant, also because the Mosh Hardness of gypsum is very low, and get crushed into lump particles, which will get heated with certain temperature. 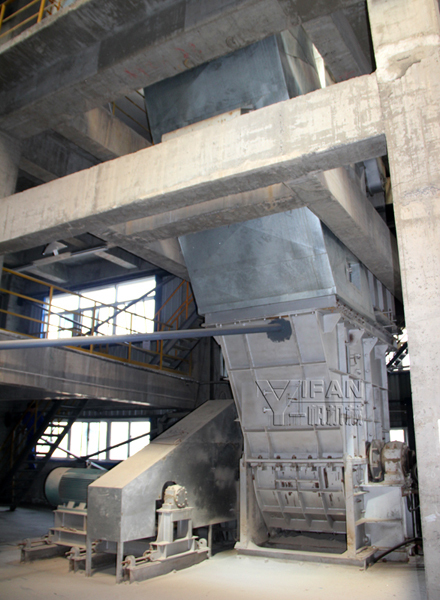 YIFAN supply a complete line of gypsum crushing production line. YIFAN gypsum crushing production line is designed with high performance gypsum crushers and assistant gypsum mining equipments, like vibrating feeder, belt conveyor and vibrating screen.